The Wobble Stopper dramatically reduces camper jack/frame stress. 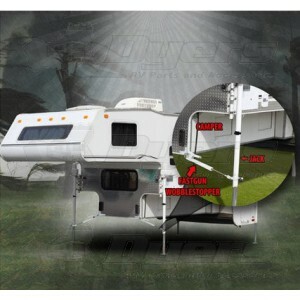 It attaches to the front camper jack legs and camper body to prevent sway while the camper is sitting on its jacks. This is for square jack applications. For round jack applications, see item # 88768. The Wobble Stopper nearly eliminates camper movement, is fully adjustable and has square or round jack applications. Composed of stainless steel and aircraft grade aluminum. It's backed by our Legendary Lifetime Warranty and is proudly made in the USA. Square camper jacks 21" -30" from body. Reduces camper jack and frame stress. High impact powder coat white. Adjusts and disconnects in seconds.